For fastpitch players, softball hair bows are practically part of the uniform. 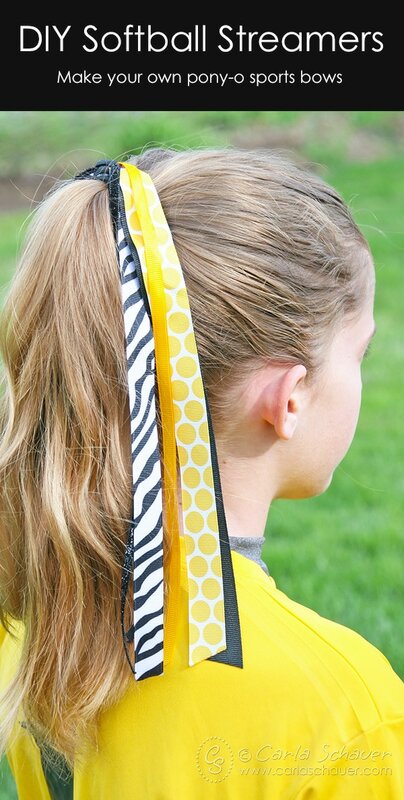 From the littlest coach‐pitch players to the college athletes, fans will find ribbons on ponytails. I made these “softball streamer” or “pony‐o” style softball bows for my daughter’s team, making sure they were made as tough as the girls are. Customize ribbon colors for teams, school spirit days, or occasions. Make a Softball Bag Tag. Step 1. Cut ribbon in 24″ lengths. I find that older girls (10+) like the longer length rather than the shorter, poofy, style. If you’re looking for short and poofy, cut ribbons to 15–20″. *tip* If you’re making bows for a whole team, cut all the ribbon at once and make them assembly‐line‐style (all of step 1, then all of step 2, etc.) rather than making one full bow at a time. It cuts down on having to switch out supplies over and over. Step 2. Arrange ribbons and sew together. Next, line up ribbons in desired order, with narrower ribbons toward the top. Thread needle, knot end, and sew ribbons, weaving in and out of each ribbon as shown. Once all the ribbons are sewn, gently tighten thread to gather ribbons together. This method will produce more volume than simply stacking the ribbons flat and stitching through them. Stitch ribbons for volume and security. Step 3. Attach ribbons to ponytail holder. These are sport bows, they need to be as strong as our players are. Stitch through ponytail holder and ribbons, wrap thread around both pieces 4–5 times, and stitch through holder and ribbons again. Knot thread, and trim excess. Secure ribbon stack to ponytail holder. Step 4. Cover thread with ribbon. Use 2″ length of ribbon (1÷2″ to 5⁄8″ wide). Tie a half‐knot in the center for a bit of extra detail, then glue knot directly in center of stitching. Hold in place for a minute or so until glue dries. *note* Do not use anything containing hard plastic or metal as a decorative accent in this area if you are planning to use these bows for sports. Those materials are illegal for safety reasons, and won’t be permitted on the field. The ribbon knot is perfectly legal. Use fabric glue for attaching ribbon knot accent. Wrap loose ends of ribbon piece around ponytail band, trimming excess if needed, and glue in place. Secure ribbon ends under band. Even‐up ribbon ends with angled cuts. Once the ends are trimmed and sealed, you’re finished. And if you made softball hair bows for everyone, you’ll have a team full of happy girls at the next practice. Yay you! Thanks for stopping by, have a great season! Make a DIY paracord water bottle holder for team goodie bags, softball coach gifts, or your favorite player. You’re welcome Suzzette, I’m glad you like them! So cute and your directions made this super easy!! Thank you! Awesome! I’m glad they worked well for you!